Home » Food and Nutrition » Can the Mediterranean Diet Slow the Aging Process? Can the Mediterranean Diet Slow the Aging Process? Almost every week it seems as if a new food or diet fad takes the health industry by storm and receives (temporary) status as the key to longevity. Unfortunately, many of these longevity diets are just short-term trends. The truth is: no one food has the ability to defend against death and illness. A dietary lifestyle however is a different story. According to a new study, eating a Mediterranean diet that is rich in vegetables and fish might help slow the aging process in the brain by up to five years. The study, conducted by researchers at Columbia University in New York and published in the peer-reviewed journal Neurology, suggests that eating plenty of fish, pulses, vegetables, and olive oil, and staying away from dairy products and red meat, will help keep the brain youthful. Researchers analyzed 674 people with an average age of 80 who didn’t have dementia and who lived in Manhattan. The total brain volume for people who followed a Mediterranean diet was, on average, 13.11 milliliters greater than those who didn’t. Their grey matter volume was five milliliters greater, and their white matter 6.4 milliliters greater compared to those who didn’t follow a Mediterranean-style diet. According to researchers, the main difference between these two groups is equivalent to approximately five years of aging. “These results are exciting, as they raise the possibility that people may potentially prevent brain shrinking and the effects of ageing on the brain simply by following a healthy diet,” says Yian Gu, the study’s lead author. 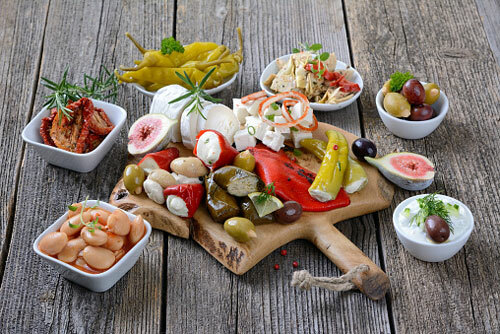 The Mediterranean diet is rich in plant-based foods such as fruits, whole grains, nuts, legumes, vegetables, as well as monounsaturated fatty acids and fish. Followers can also enjoy olive oil and moderate consumptions of wine. Eating three to five ounces of fish each week and consuming no more than 3.5 ounces of red meat each day “may provide considerable protection against loss of brain cells equal to about three to four years aging,” notes Gu. Chickpeas: Chickpeas provide high-quality protein, iron, zinc, folate and calcium—especially when eaten on a daily basis along with grains, starches and beans. They are rich in soluble and insoluble fiber, phytosterols and phytates. Phytosterols hinder cholesterol absorption while fiber and phytates help protect against colon cancer. Broccoli rabe: Broccoli rabe provides plenty of vitamin C, calcium, potassium, fiber, carotenoids and cancer-fighting indoles. Eggplant: Eggplant contains potassium, fiber and chlorogenic acid, a compound found in eggplant skin that contains antiviral and cancer-fighting properties. Couscous: Unrefined grains such as couscous are the base of most Mediterranean diets. Whole grains are digested slower and produce a gentler rise in glucose and insulin, compared to refined versions. A diet rich in whole grains and couscous may help protect against diabetes, heart disease and other chronic diseases. Olive oil: Extra virgin olive oil is rich in monounsaturated fat and antioxidant polyphenols. Many believe it’s associated with the low heart disease rates found throughout the Mediterranean. Hazelnuts: Hazelnuts are loaded with monounsaturated fats and are great sources of fiber, protein, folate, calcium vitamin E and magnesium. They’re also high in arginine, an amino acid that maintains healthy blood vessels. Tomatoes: Tomatoes are a great source of lycopene, an antioxidant that research shows can help protect against heart disease. Peppers: Peppers are great sources of vitamin A, vitamin C, folate, fiber, beta carotene and vitamin K.
Staufenberg, J., “Mediterranean diet may slow ageing process by 5 years, researchers find,” independent.co.uk, October 22, 2015; http://www.independent.co.uk/life-style/health-and-families/health-news/mediterranean-diet-may-slow-ageing-process-by-5-years-researchers-find-a6703731.html. Schwartz, R., “The Mediterranean Diet: the ultimate anti-aging regime,” Enlightened Eater web site, March 4, 2013; http://rosieschwartz.com/2013/03/04/the-mediterranean-diet-the-ultimate-anti-aging-regime/. “9 Healthy Foods from the Mediterranean Diet,” EatingWell web site, http://www.eatingwell.com/healthy_cooking/healthy_cooking_101_basics_and_techniques/healthy_foods_of_the_mediterranean_diet, last accessed October 26, 2015.